Guess who’s ready for more adventure? The turnip-throwing explorer Captain Toad, that’s who! 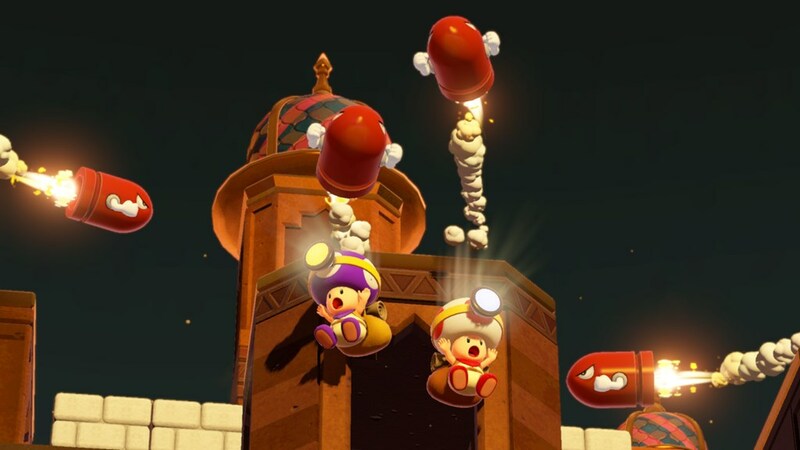 The Captain Toad: Treasure Tracker – Special Episode DLC offers a treasure chest full of Toad-ally great new content. The DLC contains 18 new challenges among five creative new courses. Ready for Kit and Krysta! Hi! Today we’re going back to the wonderful world of Captain Toad and playing levels in the Special Episode DLC. We’re also playing in co-op mode with one of us as Captain Toad and the other as Toadette. A free update is out now so you can play the entire game in co-op mode! It’s very fun, with the right partner… As always, thank you so much for watching and we’ll see you next week! The Captain Toad: Treasure Tracker DLC has arrived and features a bit of a surprise in its ending! We give our quick thoughts on it and what this "Super" connection to another Mario game could mean for the future of Captain Toad! Find out how to beat every level and collect all the gems in the Captain Toad: Treasure Tracker Special Episode DLC! Guess who is still ready for adventure? After downloading a free Nintendo Switch version update for the Captain Toad: Treasure Tracker game that is available starting today, all courses in the game will support a new two-player co-op mode featuring a second Toad to explore simultaneously with a friend. And on March 14, new paid DLC arrives that adds 18 new challenges to the game, including five new courses and new Shiny Crowns, which can be obtained in each course. If you watched today's Nintendo Direct or read the subsequent press release, you know that Captain Toad: Treasure Tracker now allows for co-op! In order to access that content, you need to update the game. That update is available right now, and will bring you up to Version 1.1.0. Guess who is still ready for adventure? After downloading a free Nintendo Switch version update for the Captain Toad: Treasure Tracker game that is available starting today, all courses in the game will support a new two-player co-op mode featuring a second Toad to explore simultaneously with a friend. And on March 14, new paid DLC arrives that adds 18 new challenges to the game, including five new courses and new Shiny Crowns, which can be obtained in each course. New players can get the Captain Toad: Treasure Tracker game together with the updates and all the new Special Episode content in a digital bundle available for purchase on Nintendo eShop beginning Feb. 13. Players who purchase the bundle or the Captain Toad: Treasure Tracker – Special Episode DLC will receive early access to one of the courses in Captain Toad: Treasure Tracker – Special Episode, with the remainder of the courses launching on March 14. What in the hell is going on here?! An unused human model has been discovered in the source code for Captain Toad: Treasure Tracker on Switch. It's unknown who this character is, or what purpose he served. We also don't know if this man can be found in the Wii U or 3DS versions. It's likely he was used for testing purposes, but it's still strange as hell! Captain Toad has taken a few moments out of his busy adventuring schedule to wish everyone a Happy Holidays with some special new art! Let's see who else in Nintendo's roster has some holiday cheer to spread as we inch closer to Christmas!